As it’s now college graduation season, it’s a good time for us to remember those who came before us — like Elizabeth Blackwell. . . .
Elizabeth Blackwell was determined to go to medical school. She consulted with some family friends who were physicians. They advised her to give up – women couldn’t become doctors back then. Elizabeth Blackwell didn’t give up. She got a job, worked hard and saved enough money for school. She applied to medical school, and received rejections from all 29 colleges to which she applied. Blackwell visited the schools in person to try to convince them to admit her. Numerous times she was advised to dress like a man and pretend to be a man to get schooling. She didn’t pretend to be anyone else. And, her persistence paid off. Elizabeth Blackwell was accepted by accident at Hobart College (then Geneva Medical College). The dean and faculty that evaluated potential students put her candidacy up for a vote with the 150 men currently enrolled. The school decided that if even one person objected, Blackwell would be denied admission. The 150 men thought the vote was a joke and unanimously voted to accept her — as a joke. Needless to say, students and faculty were disappointed when she matriculated. Fortunately, that didn’t stop her. Her anatomy professor suggested that she excuse herself from the training on reproduction, because the topic was not appropriate for a woman’s delicate mind. Elizabeth Blackwell remained. Many MDs even refused to work with Blackwell as she got her medical training. That didn’t stop her either. Elizabeth Blackwell went on to become the first woman to receive a medical degree in the U.S. (1849). When she received her degree, Blackwell was called last, after all the men. When the dean, Dr. Charles Lee, conferred her degree, he stood up and bowed to her out of admiration. The crowd was filled with local women who wanted to see history and cheered for Blackwell. 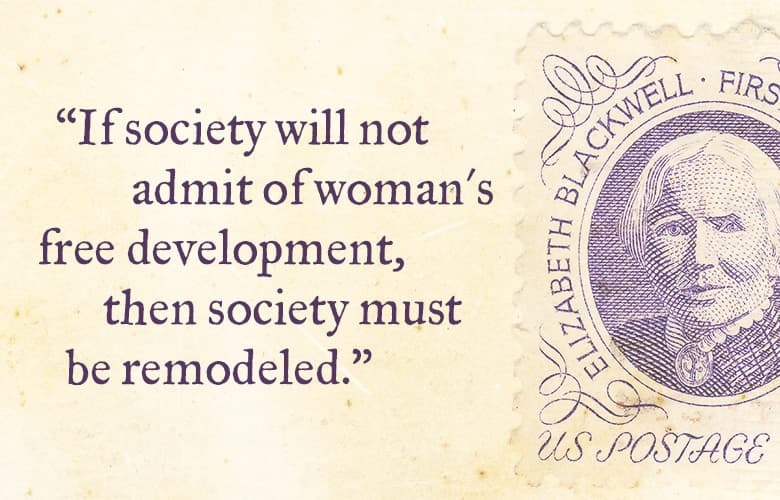 Blackwell went on to build a medical practice, to create a place where women could have medical internships (since many healthcare facilities didn’t welcome women) and to establish a medical college for women. Blackwell paved the way for others. Good thing Elizabeth Blackwell didn’t listen other people’s expectations. It’s powerful when you believe in yourself.